Even with deep price cuts and an extra day of shopping at many retailers, the holiday shopping season got off to a relatively weak start. The National Retail Federation reported that shoppers spent an average of 4% less over the holiday weekend, the first decline in spending since 2009 when the recession cut deeply into spending. Industry analyst ShopperTrak reported a modest 2.3% increase in spending on Thursday and Friday. But it said that spending at brick and mortar stores on Black Friday fell sharply compared to a year ago, as the consumers took advantage of Thanksgiving day openings. "It's spreading the jam a bit thinner over a larger piece of bread," said Bill Martin, president of ShopperTrak, about the impact of the extra day of shopping. The hope had been that a number of improvements in the economy, including record stock prices, a rebound in home values and car sales and some improvement in the unemployment rate, would result in stronger sales at the start of what will be a very short holiday shopping season. But some of the spending on cars and new homes this past year may have actually cut into holiday sales as it trimmed the amount of discretionary dollars that consumers had to spend on Christmas, according to Mathew Shay, president and CEO of the NRF. "We have this economy that can't walk [and] chew gum at the same time," he said. "[Consumers] can't support spending in both [discretionary spending and big ticket items.]" Still, the NRF is sticking with its forecast of nearly 4% growth in holiday sales, though that forecast period began Nov. 1 and runs through Christmas. Shay said that some of the holiday sales started right after Halloween this year. The NRF estimated that 141 million Americans did some sort of shopping during the four-day weekend, up just 1.2% from a year ago. It based that on a survey of more than 4,000 shoppers. But much of that gain came from online sales. The trade group reported that spending at brick and mortar stores fell nearly 9%. Internet tracking service comScore reported that shoppers spent just under $2 billion in online purchases from desktop computers on Thursday and Friday, up 17% from their online spending last year. And IBM (IBM) reported a 40% jump in shopping on smart phones and other mobile devices. While traditional retailers all offered significant online sales, comScore reported the biggest winners from the shift to online were Amazon (AMZN) and eBay (EBAY). Experts say the drop in spending at traditional brick and mortar stores is also due to even deeper discounting by retailers eager to attract shoppers. "It means for a retailer to grow at all they have to steal one from another retailer," said retail consultant Robin Lewis, co-author of 'The New Rules of Retail.' "That's one of the reasons some opened on Thanksgiving Day." 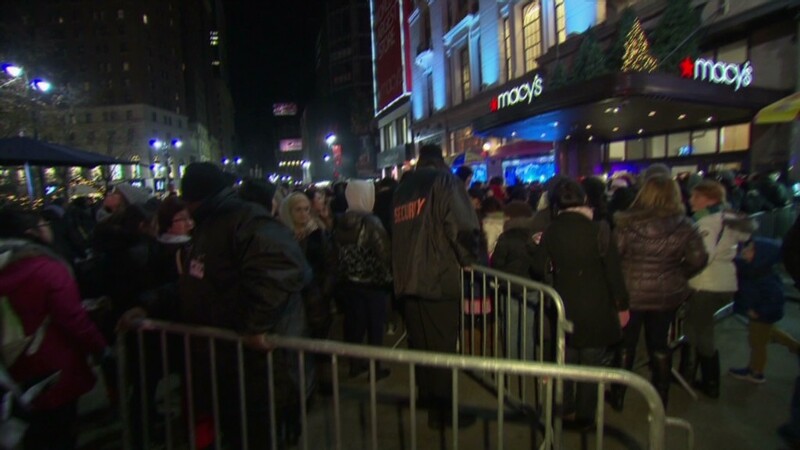 Lewis and some other experts don't believe that the extra shopping day paid off for the retailers who expanded their hours, especially considering the extra labor costs associated with being open on the holiday. "I think there will be some pull back next year because retailers can't afford to operate like that," said Laura Gurski, a partner and global leader of the Retail Practice at A.T. Kearney.